Windows RT, the version of Windows 8 built specifically to work on mobile processors, confuses a lot of people. It's best to imagine it as a Windows 8 blowup doll—though it resembles the real thing it isn't nearly as functional, but if you use your imagination you can still have a lot of fun. Microsoft Studios recently lent me a Windows RT tablet in order to check out some of the Windows 8 Xbox games they've launched on the platform, as long as I promised to clean it off before returning it. 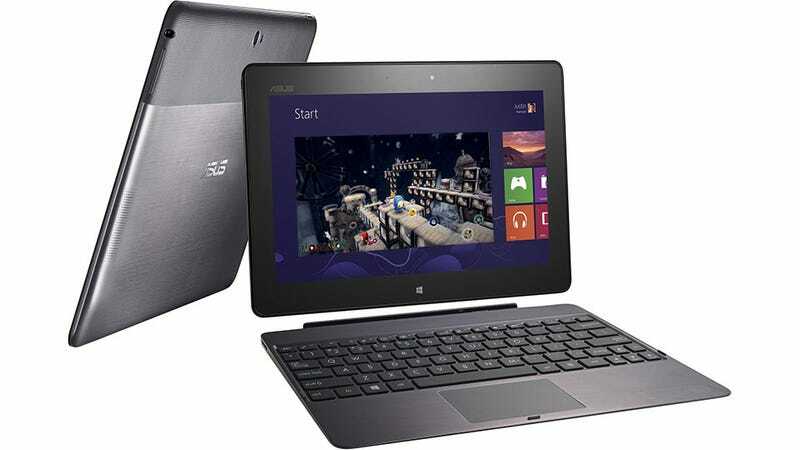 The device Microsoft Studios sent along was the Asus Vivo Tab RT, essentially the Windows RT version of Asus' Transformer line of convertible keyboard Android tablets, of which I already own a Transformer Prime. It was an odd choice, considering Microsoft makes a Windows RT version of its Surface tablet—which I also own—but I found the slim Asus tablet more geared towards gaming than Microsoft's big-and-bulky device. The only downside to the Asus compared to the Surface is the Microsoft unit has a built-in USB port, while the Vivo Tab RT has to be docked with its keyboard for USB capabilities. This is especially important for an RT device, as one of the biggest gaming advantages the operating system has is the ability to just plug in a wired Xbox controller and play. For games that support the controller, the Surface with its built-in stand offers a much more pleasing experience. The thirteen titles I took the time to play run the gamut from traditional Windows fare like Solitaire and Minesweeper to more console-style experiences. In fact, several of the games I played were ports of existing Xbox Live Arcade titles, including one of my favorite games of all time. Each game has a free trial available and is available on Windows 8 as well as RT, so if you've upgraded feel free to give them a go. Let's get right to it then, alphabetical-style. Of all the games I played on the RT tablet, this is the one that ate up the most of my time. The acclaimed combination match puzzle/hidden object game works wonderfully on the touch screen, and if you don't have a Windows RT or iOS device it's playable just about everywhere else imaginable. Just Google it. A wonderfully complex story-driven point-and-click adventure game, I wish I would have started playing Adera sooner, as I have only brushed the surface of the mystery surrounding the disappearance of Jane Sinclaire's father and the mysterious hidden city of Adera. It's one of those find some things, bring them to a place, use them to find more things sort of titles, a genre granted new life in mobile marketplaces. Thank goodness. I was disappointed to find the hero of Twisted Pixel Studios' Xbox 360 Kinect showcase game forced into a basic endless running game. Enjoyable enough, but sad—the name just doesn't fit anymore. Developer Vector Unit has proven its mastery over water-based racing to me on several occasions, and this extension of the Hydro Thunder franchise is a prime example. It's blazing fast, easily on par with the Xbox Live Arcade original, and it's a showcase for the graphical prowess of the initial batch of Windows RT tablets. Bit pricey, though. The Xbox Live Arcade version of Ilomilo is one of my favorite games of all time, so Ilomilo Plus has an unfair advantage right from the start. This version of the perception-bending puzzle platformer adds new levels and content, so it wins even more. It plays wonderfully with a corded Xbox Live controller. If you've got a platform capable of playing this, you should have already played it. You really expect me to go on and on about a free Mahjong game? Okay, maybe just a little. The tile-based board game has always struck me as the perfect game for touch screen devices, and Microsoft's offering does not prove me wrong. Simple and addictive, plus there are daily challenges to complete in order to earn badges, as if you needed more reason to poke at tiles all day. Minesweeper is not a game that any man should judge. The new adventure mode is nifty enough, with its levels and treasures and such, but it's also completely unnecessary. Minesweeper is Minesweeper. It doesn't need your approval. Still one of the most engrossing means of playing with yourself known to man. Another game with an unfair advantage, I am forever grateful to the folks at Zen Studios for all they've done to further the cause of video game pinball, one of my biggest passions. Pinball FX 2 is more a pinball platform than a game, an app that comes with a free table and plenty of extras to purchase and play. Having established my devotion, I much prefer playing it on my Xbox 360. On the Vivo Tab RT the game suffers from poor frame rates, meaning when the ball is moving really fast it's almost impossible to track it. It looks pretty sitting still, but in motion it's disappointing. Another Xbox Live Arcade game brought to Windows 8, Rocket Riot 3D does its console cousin proud. Blocks are exploding all over the screen, tiny polygon people are dying, and all is right with the world. Another grand reason to hook a wired Xbox controller to your tablet. 17-BIT's gorgeous merger of action and strategy plays just as well on Windows RT as it did when Patricia Hernandez reviewed it on the Xbox 360. Likely better, as I've yet to encounter any of the bugs she did while playing the game. And hey, thanks to the power of asynchronous cross-platform multiplayer, I could even play against her from the tablet, should the need arise. I want to tell you that Skulls of the Shogun is excellent. Taptiles is Mahjong exploded. Rather than lying flat, these tiles are arranged in 3D patterns, which can be rotated to find more matches. I had a great deal of fun with this one. Hey, I like matching things. You may have heard of Wordament—it was the first iOS game to offer Xbox Live achievements, so it's sort of a big deal. It's a timed word-building game that pits the player against everyone in the world currently playing, and it's all cross-platform, so they really mean everyone. I wouldn't recommend a Windows RT tablet for gaming. Honestly I wouldn't recommend a Windows RT tablet for anything. If you want a tablet powered by something that's not Windows, Android and Apple have that market covered. Just rest assured that should you find yourself in possession of a Windows RT device and can't trade it in for something better, like a full Windows 8 tablet, you can always take your mind off your misery with some great games. Note: I originally had Toy Soldiers: Cold War in this list, but that title is not available on RT (played it on the Surface proper). Still excellent.